First up in the War Horse line is a frame with attention grabbing matte rust and raw finishes that's sure to catch your eye. 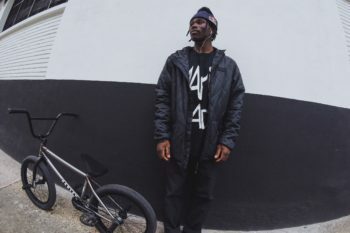 Designed precisely to DeMarcus Paul's liking it's got a 13” slammed chain stay, 75.25º head tube, 9.25” stand over, and comes in both 20.75" and 21" top tube lengths. Deemo requested a shorter chain stay "to make it easier to manual and snap spins/whips" and a top tube length that would be spacious enough to make barspins comfortable. Nothing better than getting just what you want, and this frame just might be perfect for you too. - TT Lengths: 20.75" / 21"
Outside of a frame, the part that probably most effects the way a bike is going to feel has to be the handlebars. 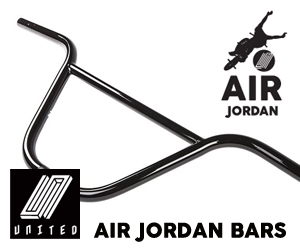 The War Horse bars feature 9” rise, 29” width, 10° of backsweep, and 1° of upsweep, produced with butted 4130 heat treated tubing and a bigger box for added strength. If you've seen any of Deemo's recent video parts these are the bars he's running and they've held up to their fair share of drops. Next up in the line is the War Horse seat featuring soft canvas style fabric, thick foam padding, camo print, and an embroidered War Horse patch. With a bit of meat to it, this seat looks to be ideal to pinch for barspins and keep up with the camouflage trend of 2016. Like 'em or not, plastics pegs are here to stay. They grind smoother, keep spots fresh, and reduce noise which may get you kicked out. After testing multiple compounds DeMarcus managed to pick the perfect sleeve, resulting in a "plastic is strong enough not to rip away easy and soft enough to not shatter." Measuring in at 4.5" and compatible with both 14mm and 3/8" with adapters these trick sticks are ready to go.